I went to the party! Or, should I say the pre-party? There were several early birds and then Kate Motaung arrived and reined everyone in from the various rabbit trails of conversation. She’s sharp as a tack. Kind of like a teacher walking into a classroom of unruly children and unbeknownst to the kids, teacher begins to corral everyone with a single question and suddenly the whole room is engaged and excited with the topic of discussion. Quite impressive! 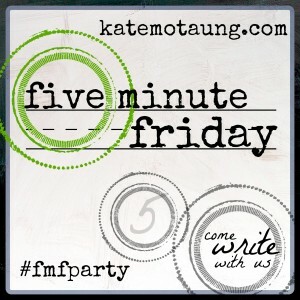 The FMF Party on Twitter, using my Kindle, was a slow motion experience for me and darn it I found myself doing exactly the same thing as I would have done walking into a “real” party of actual people – I found a safe spot, sat down, and began watching and listening – not in an assessing way but in a this is my first time and I’m going to see how this all works way. I’ll do better next time! Of course, I missed the announcement of this week’s word prompt and now it is 6 a.m. Friday and having had one cuppa coffee I’m ready to roll. The word? When I was 27 years old my then husband and two children built our dream home. The day we were doing final inspection I went into labor with our “surprise” third baby. Baby boy and I went from hospital to the new house and life was good. In July our happy little family of five went on vacation and on arriving home my husband dropped the bomb of all bombs. He had been having an affair with a very young woman since January. My life stopped. I think I stopped breathing for at least three months. We sold the dream house and the children and I were blessed to buy a tiny little house and begin our new life together. Devastated and completely mad at God – I went down a few wrong roads. I sowed some wild oats. I acquainted myself with many men. Having never worked while married I had to get out into the work world – God blessed me mightily even when I had turned my back on Him. I had great jobs! And the most important thing I had going for me? I had a praying Mom and Grandma. They never stopped praying and believing that I’d come back. I hadn’t gone anywhere except into a dark mire of sin. Sure, I was still a good mom. I still kept a good home. I worked. I went to open house at school. I cooked meals. I was hurt. I was confused. I was left thinking I wasn’t good enough. Down. Down. Down. I was hurt. I was confused. I wasn’t good enough. His grace found me. The sun began to shine again as The Son began to swoon me. His grace FINDS a way. WOW! Thanks for sharing. I can’t imagine the shock of finding out such news that turned your world forever upside down. I am glad you found your way back and grace through it all. Blessings and peace to you! Stopping by from FMF. Leigh, glad you came by. Thanks for your kindness! Susan, so glad you jumped in. You have shared with a transparency which will touch those who read your words. I am so glad His grace found you and me. Even more grateful that His great grace finds me & meets me each day. Also, no words to express my gratitude for the song you shared. While I have heard it before, I needed the reminder! Blessings! Joanne, seems the Lord has me revealing a little more of my ugly past with every post lately!!! Hope it’s not too much information but a strong dose of 2 Corinthians 1.3-5! Hey, Mimi! Good job on the party, I’m scared to even try! The most I do is interact with you and Tammy. I’ve yet to really do the thing, I’ve been sitting back in that chair in the far corner for about 4 months now. Just call me wallflower. But this. Thank you so much for sharing your heart and your testimony. I’ve been sensing a bigger story there for quite some time. We all have baggage. I have it too. Thank you for being real and being a living testimony to God’s grace! O! Gigi, you haven’t heard nothin’ yet!! !~ YSFAM!!! I’m so thankful that God’s grace found you. God takes our dust and brokenness and turns into beautiful things. Check out Gungor’s song and video “Beautiful Thjngs.” It’s one of my recent faves!! Love you friend!! you are exploding with raw, real, Jesus stories! Have you noticed? The Bible may be used in Sunday School, but most of those stories are pretty ugly. I am so sorry for the pain you felt, but LOVE how you show that God can turn anything into His glory. Absolutely ANYTHING! You’re letting it shine, you Brave Girl!! I mentioned you in my post…I’m bringing up the caboose at #62 today. Tammy – I know, right? What is God doing? Bringing me out of the closet? Time to be real! xo Thanks for the mention – I’ve already visited you girlfriend and left a comment. I love your stories! It gives hope another chance! It gives hope another chance! Now, that is quotable! Thanks Margie. I really appreciate your transparency, Susan. Thank the Lord for finding you and pulling you back to Him! He did that for me, too, and I still marvel that–even though I was so far away–He didn’t give up on me. Amazing grace, indeed. Thanks for stopping by my blog, and welcome to #fmfparty! It is a marvel, isn’t it Melissa? Amen! Thank you for sharing your journey of grace. I’m so glad He found you! Oh Susan, thank you for sharing your story. 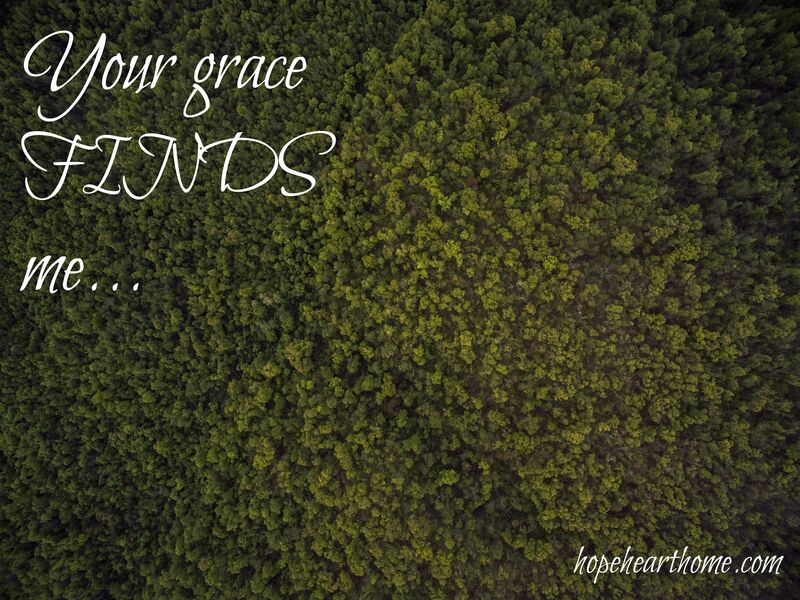 I love the truth that His grace finds us, even when we’ve gone far astray of the straight and narrow. I’m glad you embraced His grace for you and found your way back to Him. Thank goodness nothing we can do makes Him stop loving us. Thank goodness for exactly THAT, Jeanne. Love having you as part of the FMF community. Your story here is so transparent and full of hope as only we can find in God. It is amazing how God’s grace finds us in all things. I am a big grace girl, that is one who seeks it and needs it often. You also chose one of my favorite songs by Matt Redman. SO grateful for you! The longer I live, and the closer I get to dying, the more I realize that NO life-journey is really the stuff of pride. It’s a continuum of good and bad intermingled; and sometimes the good rose from the compost of what we sharply regret, so ‘eliminating’ the bad kills off the future good as well. You’re here now, Susan; a strong woman of faith, and that strength comes from the damage you endured. The wounds you suffered – even those that were self-inflicted – have allowed you to shield others. I kinda think God’s pretty proud of you. I believe we have a mutual admiration society going on here! Thank you Andrew for visiting me over here at HHH! Powerful story. A praying mom and grand ma. His Precious Grace makes a way!